3D or not 3D? That is the question many radiologists are asking as they consider the most effective use for digital breast tomosynthesis (DBT). With FDA approval earlier this year for Hologic’s Selenia Dimensions system for use in both breast cancer screening and diagnosis, U.S. hospitals and imaging facilities gained the ability to offer women conventional 2D digital mammography with 3D digital imaging. Breast imagers are still sorting out where DBT fits into their screening and diagnostic imaging regimen. While this new technology, called Dimensions 3D, can help answer questions for women, it still leaves some issues regarding its optimum use and capabilities. Tomosynthesis provides individual images of thin layers of breast tissue, producing clearer images than conventional mammography. With DBT, images are obtained in a similar fashion to a CT scan, although the rotation of the detector is more limited than the 360-degree rotation of the CT scanner. This also means that DBT captures fewer images than CT. However, the DBT process still provides enough image separation of normal overlapping tissue to detect cancer that may otherwise go undetected. In materials published by Hologic (the company declined to be interviewed for this article), Dimensions 3D is described as the first commercially available breast cancer screening and diagnostic technology to deliver on the promise of breast tomosynthesis. The system produces conventional 2D images and has the option of offering patients a 3D tomosynthesis exam in combination with the conventional 2D digital mammogram. Hologic announced in February that it received FDA approval for Dimensions 3D. Clinical trials using the system showed measurable improvement in clinical performance over conventional mammography as well as gains in specificity, improved lesion and margin visibility, and the ability to accurately localize structures in the breast. According to Hologic, DBT produces 3D images intended to reveal the inner architecture of the breast without the distortion that can result from tissue shadowing or density. Tomosynthesis images are acquired with the breast held briefly in compression, just as it would be during a conventional mammogram. The exam consists of a tomosynthesis image in combination with a 2D image. This “combo-mode” method allows for both images to be taken during the same compression. In addition, the company says combining the two modalities takes into consideration radiologists’ existing familiarity viewing 2D images. The DBT scan results in a stack of thin, high-resolution image slices intended to provide a clear rendition of structures in the breast and their spatial relationship with the surrounding breast tissue. Images are displayed on a standard diagnostic workstation for review by a radiologist. 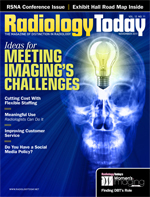 “With just one touch, the system allows users to conduct exams tailored to the specific needs of each patient, with the option of conventional digital mammography only, tomosynthesis only, or 2D and 3D combo-imaging done under one compression, resulting in coregistered images,” said Hologic Director of Marketing Jim Culley via a press release. In a press release issued by the FDA, the agency notes that as part of the approval process for Dimensions 3D, it reviewed results from two studies where radiologists were asked to review 2D plus 3D images from more than 300 mammograms. In both studies, the radiologists obtained a 7% improvement in their ability to distinguish between cancerous and noncancerous cases compared with viewing 2D images alone. To perform tomosynthesis, the detector must acquire high-resolution images at a relatively high speed while maintaining good imaging performance at a low dose per image. When it comes to the length of an exam, Hologic says the DBT process takes only seconds longer than a conventional 2D digital mammogram, and the total exam dose is within current FDA guidelines. The image acquisition time is approximately 15 to 20 seconds, and the radiation dose is only 1 to 1.5 times the radiation normally given in a standard screening mammogram. However, because the DBT exam requires two additional exposures over a standard mammogram, the total radiation dose from the combined 2D and tomosynthesis examination is three times that of a standard mammogram. Speaking to increased radiation levels, the FDA notes that the combination of the system’s 2D and 3D images approximately doubled the radiation dose received by patients in the studies. However, the technology improved the accuracy with which radiologists detected cancers, decreasing the number of women recalled for a diagnostic exam. The increase in cancer risk from having both a 2D and a 3D exam is expected to be less than 1.5% compared with natural cancer incidence and less than 1% compared with the risk from conventional 2D mammography. Carol H. Lee, MD, chair of the ACR’s Breast Imaging Commission, notes that some radiologists are “gung ho” about the tomosynthesis’ potential in breast cancer screening and diagnosis. However, she believes it’s too early to determine how useful this next advance in breast imaging technology will be. The system was approved for both screening and diagnostic uses as an adjunct to conventional 2D breast imaging, not as a replacement, Lee points out. In addition, the FDA required that 3D images be taken along with 2D images. Both images are required because studies done in advance of FDA approval did not conclusively show better sensitivity of 3D alone compared with 2D images alone. As the technology advances, there is the possibility that the FDA could approve a 3D-only device for imaging. Questions also arise regarding protocols for who should undergo DBT. Is DBT the right choice for everyone or just for women at greater risk of breast cancer, including those with dense breast tissue or those with a family history of the disease? There is currently no industry standard for DBT, leaving facilities to establish their own criteria for when to use the modality. At Elizabeth Wende Breast Care in Rochester, N.Y., one of several clinical sites for Dimensions 3D, DBT is being used for breast screenings and as a tool in diagnosis. Radiologists at the Rochester facility are also looking at ways to utilize tomosynthesis in cases where patients’ mammograms showed overlap of tissue, recalling women to obtain an “extra view” of questionable breast tissue. Destounis says in some instances, this second scan, using DBT, enabled clinicians to rule out a patient’s need for biopsy. Destounis presented research findings at the American Roentgen Ray Society’s annual meeting earlier this year showing that DBT is comparable to or better than conventional digital breast mammography at identifying microcalcifications in up to 95% of cases. Elizabeth Wende was one of the sites that collected data while using Hologic’s Dimensions system. These data contradicted earlier clinical trials with DBT that found the technology was better at identifying masses than microcalcifications. The change in findings could be the result of advancements in the technology or of radiologists’ improved ability to read 3D images now as compared to when initial studies were conducted. “Early on, the calcifications did not look as crisp as they did in 2D, but that was with an earlier version of the technology,” Destounis says. As Destounis notes, one reality of DBT is the current lack of reimbursement for this modality, and purchasing systems can be costly. If a facility is just planning a conversion to digital mammography, this could be a viable option because the Hologic system does both, she says. However, for hospitals and imaging centers that have already made the switch, it could be cost-prohibitive to replace relatively new digital mammography equipment right away. Conversely, Lee says to completely abandon the technology would not be beneficial either.